The LIFE Alister Project, as presented and accepted by the European Union, has four operational goals. 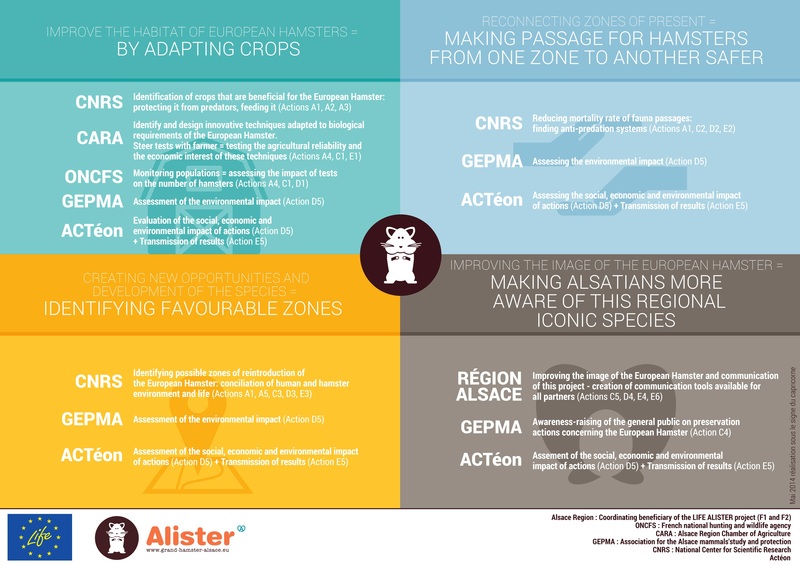 “Improving the image of the animal and making Alsatians more aware of this iconic regional species,” is one of them, equal to research actions or agricultural experiments. The GEPMA, or Alsace Mammal Study and Protection Group, which heads the awareness raising action for Alsatians on the problem of the European Hamster in Alsace (Action C4), has met with the general public and uses innovative communication supports. The main idea is to impact the largest number of people without limiting these to predetermined age or social or professional categories. Consequently, many different tools were created in 2015: a board game and a video game called Playing the Role of the European Hamster in Alsace for those who like games, personalised coffee or hot chocolate cups for those in a hurry, who nonetheless had all the key information on the handle of their cups, as well as colouring books and cut-outs for the younger children. 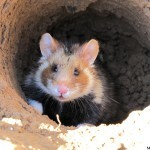 At the same time, the Alsace Region, which coordinates the Alister project, drew up an information sheet, designed a hamster mascot the size of a human and opened a Facebook page. GEPMA thus had all of these tools available to meet the general public and hosted 24 awareness raising stands from April to December 2015, with the assistance of the ONCFS, the project’s other partner. Sixteen municipalities welcomed this association, not only in Alsace, but also in Lorraine and in Champagne-Ardenne. On average, each stand had 150 visitors, of all ages, who were thus able to discover the extraordinary life of hamsters and the different programmes that were put in place to protect them. 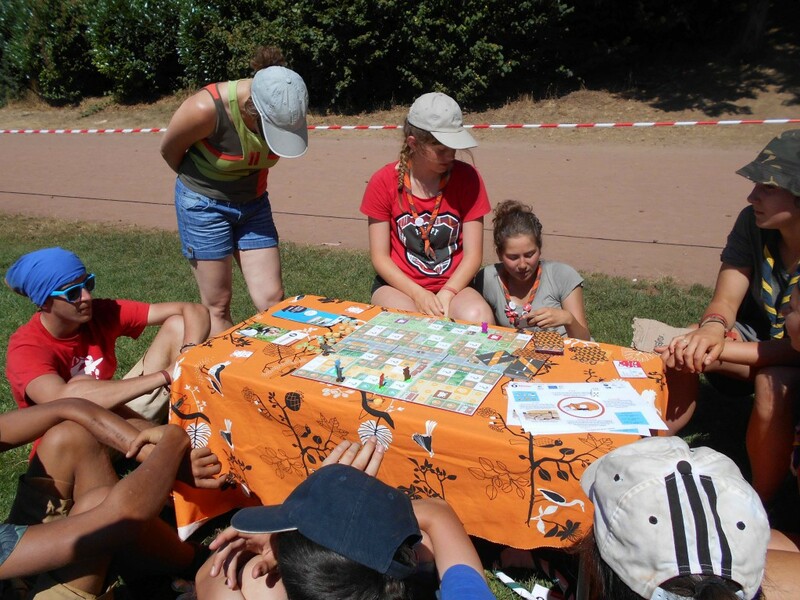 Nearly 400 persons competed against each other in the board game, and a hundred played the video game on the stands; outside of the stands, this video game was downloaded via the project’s internet site nearly 3,500 times. 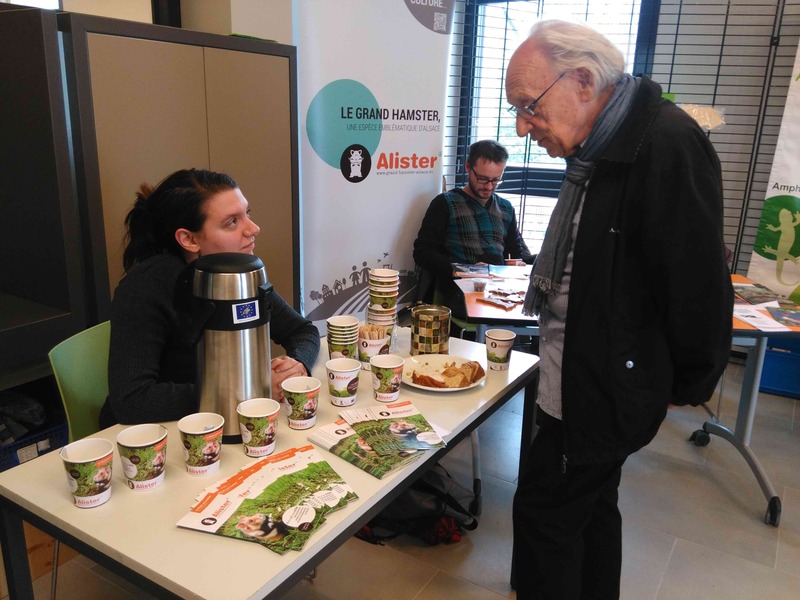 These meetings allowed the LIFE Alister Project partners to discuss with the public and explain things, whilst gaining knowledge on what the general public knew about the European Hamster and their feelings about it. This information is very important to meet expectations and respond to questions. For example, the mascot is a very good way to spark a dialogue, and at this time, we noticed that many teenagers or parents of young children, who often wanted a photo of themselves with the mascot to share on social networks, knew nothing about this animal. 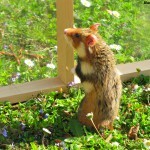 They did not know that it was a wild hamster, living only in Alsace. When they learnt about it and what the project was about, they were really interested. 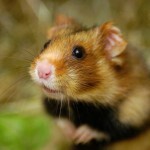 Elderly persons often knew about the European Hamster, and still share the image that this animal was a nuisance. These exchanges prove that there is still a lot of work to be done to raise awareness in the general public and that using games and our mascot to do this is a good way of engaging conversations. GEPMA will continue these activities in 2016. Dates and venues of the stands are regularly updated on the site’s home page and are also published on GEPMA’s and LIFE Alister’s Facebook pages. 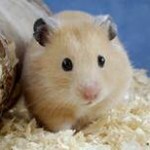 If you would like to host a hamster activity (summer camps, village festivals, seminars, etc. ), please contact GEPMA by mail: j.roux@gepma.org or by phone at (+33) 3 88 22 53 51.